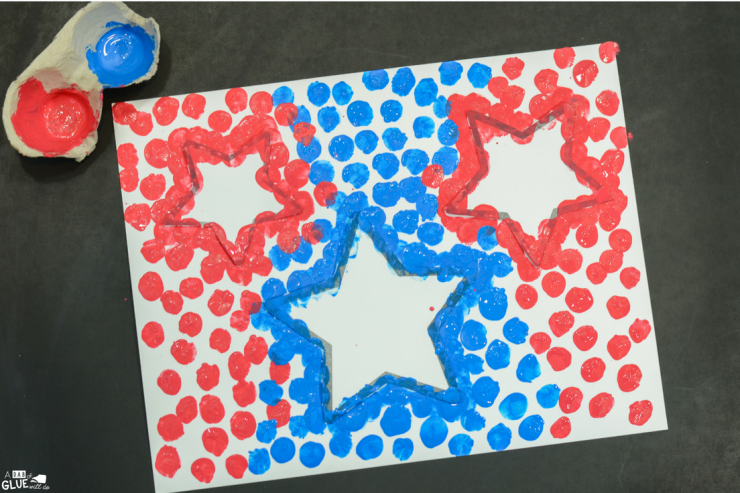 Celebrate the Independence Day with this 4th of July Thumbprint Craft. 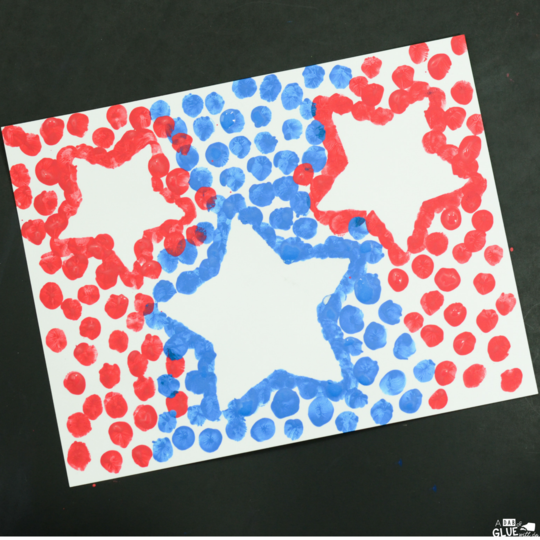 These stars made in red, white, and blue make for a great patriotic art activity! 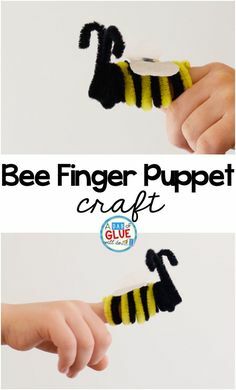 This craft is a part of the Thumbprint Art series which are great fine motor crafts for preschool and kindergartners. 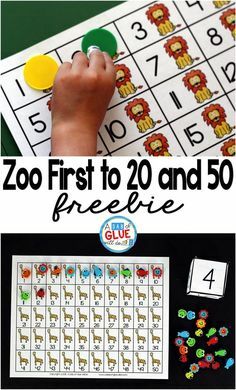 To get this craft ready, you’ll need to print the template onto cardstock. 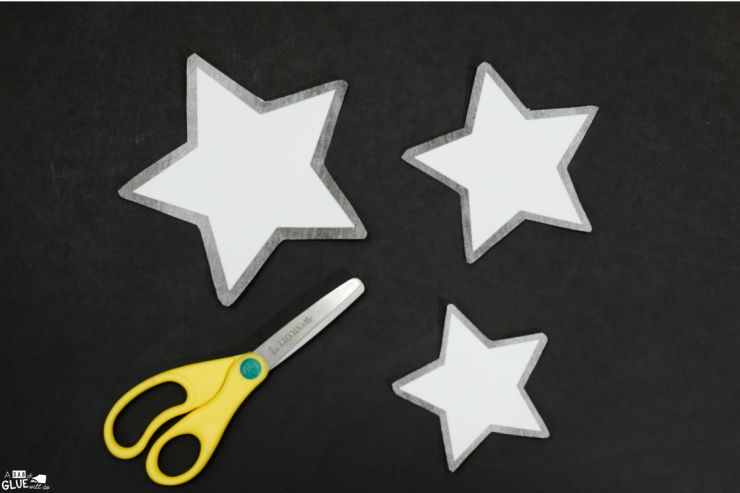 Next, cut out the stars, making sure to cut outside of the black line. 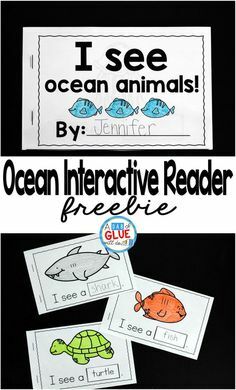 This will help the students see the shape outline as the make their thumbprints. 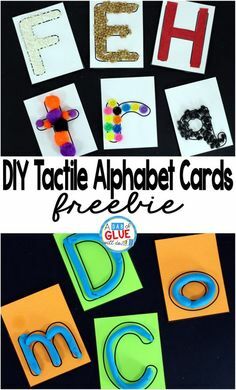 Get the paint ready for the kids to use by putting it out onto a plate or something the can press their thumb onto. This time we used empty recycled cartons. It also helps to get the tape ready by rolling it into pieces, ready to use to stick the letters and heart down. 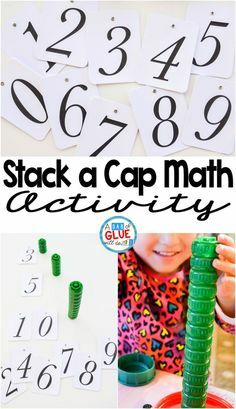 For this craft, they will need many small, rolled, pieces of tape. Masking tape (painters tape) works best for this. The regular clear tape could tear the background paper. 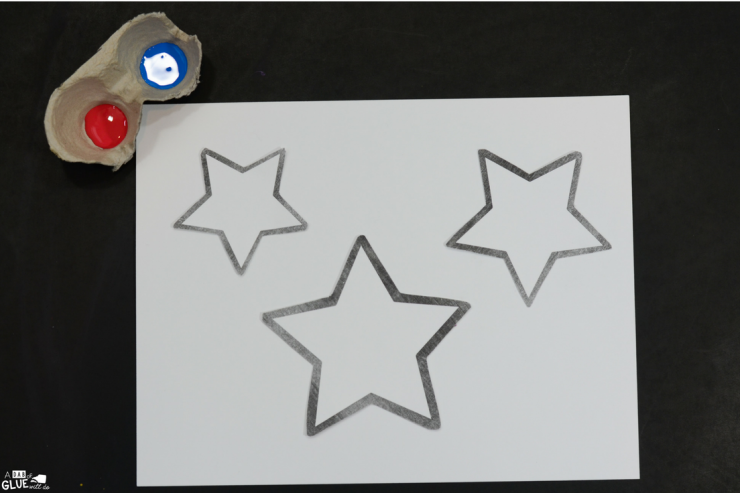 The students will start by taping the star pieces down onto the paper. 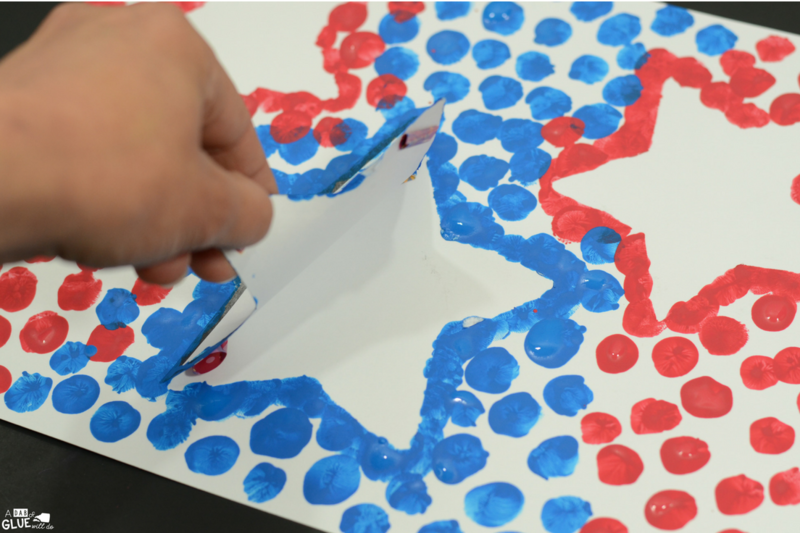 It is best to use a piece of rolled tape on each point of the star so that no edges are sticking up for the paint to get under. Next, choose red or blue, and begin making thumbprints all around the edges of the stars. 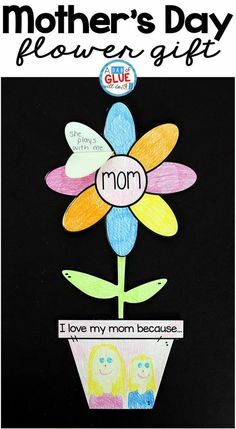 Be sure to fill in the gaps with more thumbprints. Continue making thumbprints around each star. You can switch to red or blue (whichever you didn’t use yet) if you’d like. 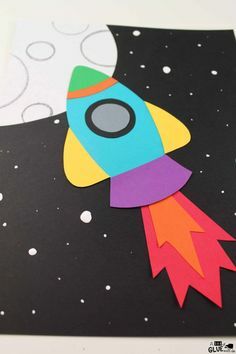 Next, begin making more and more thumbprints going away from the stars. Continue to make more thumbprints all around the rest of the page. You can overlap thumbprints if you’d like. When you get to the corners, it helps to hold the paper down so it doesn’t lift while you make your prints. After the stars are outlined with thumbprints and there are prints all around the paper, let the paint dry. 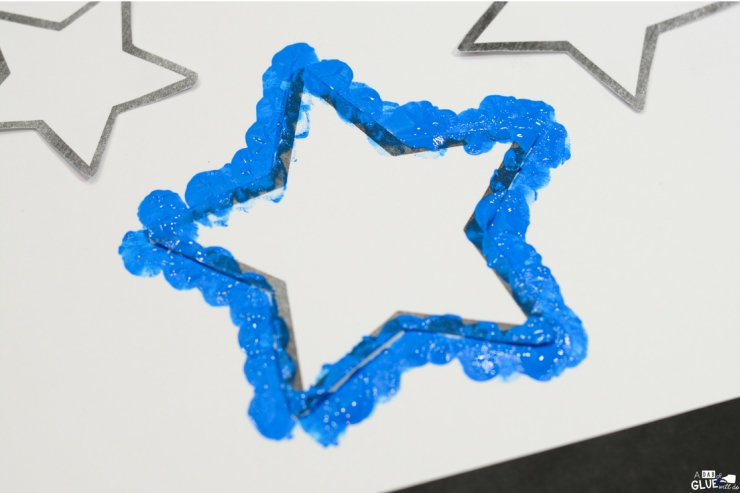 After the paint dries, slowly pull up each star to reveal your star shapes! Now you have some festive and patriotic art to celebrate the 4th of July! Isn’t it pretty?! 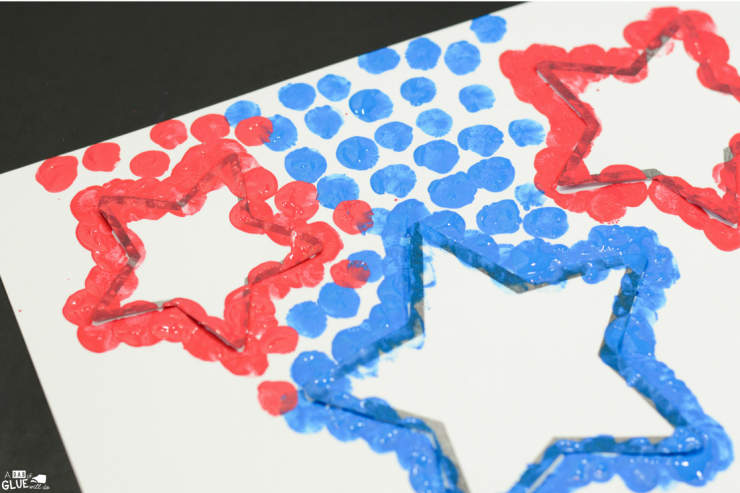 I hope that you and your students enjoy this 4th of July Patriotic Stars Thumbprint Craft!